Haq's Musings: Is Husain Haqqani Switching Loyalties Yet Again? It is well-known that Mr. Husain Haqqani, who served as Pakistan's ambassador to the United States from 2008 to 2011, has a long history of opportunism. He has switched loyalties many times since he began his career in Karachi, Pakistan in 1980s. Does former Ambassador Haqqani's latest Washington Post Op Ed titled "Yes, the Russian ambassador met Trump’s team. So? That’s what we diplomats do" signal yet another shift in his ever-changing loyalties? Is the Washington Post Op Ed an attempt by Mr. Haqqani to ingratiate himself with President Donald Trump by defending the Trump campaigns' controversial contacts with Russia? Is he doing what his current employer Hudson Institute, a conservative right-wing think tank, expects him to do? Is he also reminding the Trump administration of the valuable services he rendered to the United States while working as Pakistan's ambassador in Washington by confessing that "I had facilitated the presence of large numbers of CIA operatives" in Pakistan? Husain Haqqani began his career in 1980s as General Zia ul Haq's loyalist when he was affiliated with Islami Jamiat Talaba (IJT), a right-wing student group with close ties to the Jamaat-e-Islami, a political party in Pakistan. "When Zia was alive, they (Zia's supporters) didn't have to come out. In fact, on most recent Fridays, when I went to prayer, my maulvi (Islamic preacher) has been blasting Zia as a phony and un-Islamic....Yesterday (after Zia's death), he was crying. The basic division in our society is between the Islamicists and the secularists, and this crowd today is saying that the highly religious segment of society cannot be ignored now that Zia is gone." After the death of the general in a fiery air crash, Haqqani joined Prime Minister Sharif's right-leaning Muslim League and served as his press secretary followed by ambassadorship in Sri Lanka. When Nawaz Sharif lost his job, Husain Haqqani joined left-leaning Pakistan People's Party and became Prime Minister Benazir Bhutto's spokesman. In a piece published in 1999 by Asian Wall Street Journal, Haqqani explained his changing loyalties in the following words: "Over the last three decades, I have alternated between being attracted to and repulsed by political Islam". The fact is that Mr. Haqqani has always been attracted to whoever is in power. Currently, Haqqani is doing what is expected of him by his bosses at the right-wing Hudson Institute, a Washington think tank funded by the extreme right groups in the United States. Gatestone Institute, an offshoot of the Hudson Institute, is actively engaged in funding and promoting Islamophobia in America. Ambassador Husain Haqqani has said in his Washington Post Op Ed that "I had facilitated the presence of large numbers of CIA operatives" in Pakistan. 1. Is it part of an ambassador's job to send foreign intelligence agents into his or her own country without the knowledge and consent of his country's intelligence folks? 2. Can an ambassador trust that foreign intelligence operatives will only do what they promise in the ambassador's home country? Could it be that Bin Laden hunt was just an excuse to let in "large numbers of CIA operatives "who most likely have a far wider wider agenda, including tracking Pakistan's nuclear assets and spying that could risk Pakistan security? 3. Can an ambassador trust foreign intelligence agents more than his country's intelligence professionals? 4. How can an ambassador make sure that undercover foreign agents unknown to Pakistan's intelligence agencies would stick to doing only what they say they will do? Since his dismissal as Pakistan's ambassador in Washington, Mr. Husain Haqqani is nursing a grudge against Pakistan that is evident from his "research recommendations" for US policy on Pakistan. In 2012, barely a year after he was let go as Pakistani ambassador, Mr. Haqqani recommended that the United States "divorce" Pakistan. For example, in a 2015 Wall Street Journal piece, he questioned "why are we sending this attack helicopter to Pakistan?" The "we" here is noteworthy given that he is currently a citizen of Pakistan. Mr. Haqqani's main worry was that "American weapons will end up being used to fight or menace India". In 2016, Mr. Haqqani argued against US sales of F-16s to Pakistan and agreed with the Indian lobbyists that the F-16s would be used against India, not for fighting terror as Pakistan said. Pakistan People's Party leaders have rejected Husain Haqqani's claim that he "acted under the authorization of Pakistan’s elected civilian leaders" when he "facilitated the presence of large numbers of CIA operatives" in Pakistan. 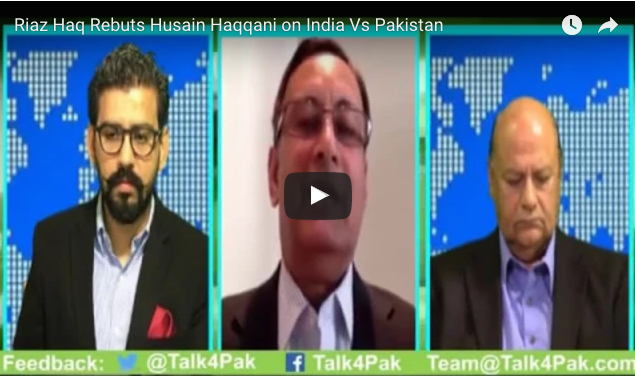 Mr. Husain Haqqani has a long history of changing loyalties. He has often recommended US policy positions that are seen as detrimental to US-Pakistan ties, especially since his 2011 dismissal as Pakistan's ambassador in Washington. He has recently said he "had facilitated the presence of large numbers of CIA operatives" in Pakistan when he served as Pakistani ambassador in Washington from 2008 to 2011. His claim that he did so with Pakistani government's authorization has been rejected by the leaders of the Pakistan People's Party that governed the country at the time. Is Trump Taking Advice From Husain Haqqani? Debunking Mr. Haqqani's Op Ed "Pakistan's Elusive Quest for Parity"
opportunist, and loyalty to any one politician or political ideology is not his thing. Ahsan: "The Urdu term "thaali ka bangan" describes Mr. Haqqani best"
I think Husain Haqqani is much worse than a "thaali ka began". He has absolutely no conviction. The world loyalty is not in his vocabulary. No one can trust him. I bet Pakistan's enemies do not trust him either, though they find him useful for now. I think Iqbal had Husain Haqqani in mind when he wrote: Jaafar az Bangal Sadiq az Dakan/ Nang e Millat Nang e Deen Nange Watan. He is nothing more than a gold digger. He has been doing it to please any one who can pay for his loyalties. Hussain Haqqani's loyalties belong to the highest bidder. Hussain’s public career is too public for anyone to take him for granted. He has done it all. A Jamiat boy at Karachi University. Took up journalism as career after graduation. Started political career as a supporter of Ziaul Haq. In 1990 he became Prime Minister (PM) Nawaz Sharif’s special assistant. From 1992 to 1993 he served as Pakistan’s High Commissioner to Sri Lanka. From 1993 to 1995, he was spokesman for PM Benazir Bhutto (BB). After the ouster of PM Nawaz in 1999, he lobbied for a job in the Musharraf government winning some consulting contracts through the good offices of then finance minister Shaukat Aziz and then was interviewed by General Aziz for the post of Information Secretary but failed to get the job. After having lost any hope of getting into the Musharraf regime he went to the US to join a think tank where he once again revived his contacts with BB and assisted her in lobbying power brokers in the US establishment. And when the PPP came to power after the 2008 elections he successfully lobbied for the post of US ambassadorship. Interestingly, it was not Zardari but President General (retd) Musharraf who appointed him to the coveted post in April 2008, of course on the recommendation of the former who had to wait for another five months to enter the presidency. Meanwhile he has authored two very interesting books both open indictments of Pakistani establishment for what he claims the ‘harmful’ consequences of its policies. Three persons from the PPP side have responded to the claims made by HH in his Washington Post piece. Two of them, Sherry Rehman and Syed Khurshid Shah, do not appear to know what they are talking about. Their statements sounded more like whistling in the dark fearing perhaps another round of PPP bashing by the media. But Farhatullah Babar’s response was measured and perhaps the right one at the right time. Babar said all visas issued to US nationals under the PPP tenure were given in accordance with the laid-down procedure involving various state agencies and no irregularity whatsoever was committed. Islamabad’s response was to argue that Pakistan does, indeed, support insurgents in Afghanistan, but it does so because of security concerns about India, which is seen by generals and many civilian leaders as an existential threat to Pakistan. But that excuse is based on exaggerations and falsehoods. India has no offensive military presence in Afghanistan and there has never been any evidence that the Afghans are willing to be part of India’s alleged plan for a two-front war with Pakistan. Afghanistan’s president, Ashraf Ghani, recently asked India to train Afghan military officers and repair military aircraft after frustration with Pakistan, which failed to fulfill promises of restraining the Taliban and forcing them to the negotiating table. Pakistan’s leaders question Afghanistan’s acceptance of economic assistance from India even though Pakistan does not have the capacity to provide such aid itself. It seems that Pakistan wants to keep alive imaginary fears, possibly to maintain military ascendancy in a country that has been ruled by generals for almost half of its existence. For years Pakistani officials falsely asserted that India had set up 24 consulates in Afghanistan, some close to the Pakistani border. In fact, India has only four consulates, the same number Pakistan has, in Afghanistan. Lying about easily verifiable facts is usually the tactic of governments fabricating a threat rather than ones genuinely facing one. As ambassador, I attended trilateral meetings where my colleagues rejected serious suggestions from Afghans and Americans to mitigate apprehensions about Indian influence in Afghanistan. While evidence of an Indian threat to Pakistan through Afghanistan remains scant, proof of the presence of Afghan Taliban leaders in Pakistan continues to mount. Mullah Omar, the Taliban’s leader, reportedly died in a Pakistani hospital in 2013 and his successor, Mullah Akhtar Mansour, was killed in an American drone strike in Baluchistan Province in Pakistan last year. The United States should not let Pakistan link its longstanding support for hard-line Pashtun Islamists in Afghanistan to its disputes with India. Both India and Pakistan have a lot of blood on their hands in Kashmir and seem in no hurry to resolve their disagreement, which is rooted in the psychosis resulting from the subcontinent’s bitter partition. The two countries have gone through 45 rounds of summit-level talks since 1947 and have failed to reach a permanent settlement. Linking the outcome in Afghanistan to resolution of India-Pakistan issues would keep the United States embroiled there for a very long time. The recent rise in Islamophobia in India and a more aggressive stance against Pakistan by Prime Minister Narendra Modi should not detract from recognizing the paranoiac nature of Pakistan’s fears. Days after the Pentagon announced it is withholding $50 million intended for Pakistan as part of its Coalition Support Fund, the South Asian country's ambassador hinted at potential retaliation, possibly coaxing Washington to negotiate access to the country's air corridors, which Islamabad suggests have been taken for granted. Pakistan is ready to cooperate with the United States, Ambassador Aizaz Ahmad Chaudhry said, though Washington may now end up having to negotiate with Islamabad on the corridors and other tangible assets, he added. "All that Pakistan has done in the fight against terrorism has not been sufficiently factored" into the U.S. decision to reduce its support funds, Chaudhry lamented during a discussion this week at the Washington office of the London-based International Institute for Strategic Studies. Pakistan has facilitated air and ground logistical support for U.S. troops in Afghanistan "like no one else," Chaudhry said, adding that "since 2001, all air corridors from Pakistan have been available to the United States free of cost." The reason Pakistan did so "was because we believed this was a common war," the ambassador said, but there have been occasions when U.S. actions have left his country's leaders thinking "that perhaps we are not partners." Questions concerning Pakistan's commitment to bilateral partnership have also been raised by the U.S. A prime example was the discovery in 2011 that al-Qaida leader Osama Bin Laden had been living undisturbed near a key Pakistani military facility. U.S. Secretary of Defense Jim Mattis said he withheld $50 million in Coalition Support Funds because he couldn't certify to Congress that Pakistan had taken sufficient action against the Haqqani network, a Taliban-associated organization which the U.S. has deemed a Foreign Terrorist Organization, since September 2012. The group has been blamed for attacks in Afghanistan, which have contributed to the country's destabilization, an issue of concern to the U.S.
For its part, Islamabad's message is don't drop "every security lapse in Afghanistan on Pakistan's doorsteps," as the country's ambassador to the U.S. put it. The Pakistani envoy's remarks came at a time when U.S. President Donald Trump's administration has been reviewing its overall strategy toward South Asia, including India, Pakistan, Afghanistan and Iran. And his defiant tone may reflect Pakistan's decreasing dependence on the United States amid an influx of Chinese capital investments and a strengthening political relationship between Islamabad and Beijing. The Gatestone Institute has pumped out reams of dangerous anti-Muslim propaganda, and its ties to UK groups deserve close scrutiny. The Gatestone Institute, a New York-based think tank, has become one of the most important hubs in America’s Islamophobia industry, pumping out reams of dangerous anti-Muslim propaganda of the kind lapped up by far-right mass murderer Anders Breivik. The transatlantic dimensions of Gatestone’s influence have so far gone largely unnoticed, but its close links to several British groups, including the Quilliam Foundation, Stand for Peace and the Henry Jackson Society deserve close scrutiny. Despite its virulent anti-Muslim racism, Gatestone has been able to maintain a large roster of contributors, including a number of Muslim authors. When I interviewed one former Gatestone contributor, Shiraz Maher, who now works at King’s College London’s International Center for the Study of Radicalization (and built his career on the back of his claims to be a reformed “ex-extremist”), he confirmed he had been paid for articles, but declined to say how much. However, a separate policy analyst, who agreed to be interviewed on condition of anonymity, named a different UK-based Muslim writer on Gatestone’s books whom he claimed was being paid, in return for producing articles “on demand,” the tidy sum of $65,000 a year. These figures fit with the fact that Gatestone’s revenue was reportedly $1.1 million in 2012 and that attendees at its events were at one point being asked for a "minimum donation of $10,000." When I pointed out to Maher the prominent Islamophobia in the writing of Peder Jensen aka “Fjordman” and a plethora of other Gatestone authors, Maher said he no longer contributed articles to the think tank. But others in the UK—who similarly style themselves as “anti-extremists” yet apparently see no irony in associating with this extremely Islamophobic (but also extremely well-funded) think tank—have forged links with Gatestone more recently. Chief among these is the Quilliam Foundation. In January 2015, just days after the Paris attacks, Gatestone spent approximately $100,000 taking out a full page advert in the New York Times. To drive home its implicit message that a “good Muslim” supports US power, two out of the three Muslims pictured in the Gatestone advert were posing next to the American flag. Mentioning violence in Iran, Iraq, Syria, Nigeria, Egypt and “Africa,” the text of the advertisement effortlessly ignored all other violence in the world not involving any of the world’s 1.6 billion Muslims and simultaneously glossed over the context-specific political factors at play in each conflict. The subtext was clear: Gatestone was advocating a mono-causal explanation for this violence and put the spotlight firmly on Islam. The rescue of American hostage Caitlan Coleman and her family by Pakistan's military may prove to be a big step toward improving strained ties between Washington and its nuclear-armed ally. Hours after details of the operation to free the Pennsylvania native from a horrific five-year ordeal emerged Thursday, statements by Pakistani authorities, the State Department and even President Donald Trump all praised the benefits of intelligence sharing and cooperation. That appeared to indicate a positive turn in a relationship that has been fast deteriorating since the start of the Trump presidency. Before being elected to the White House, Trump had repeatedly tweeted that Pakistan "is not our friend." The Pakistan military said that it took action after being alerted by U.S. intelligence that Coleman, her Canadian husband, Joshua Boyle, and their three children were being moved across the border from Afghanistan. They had been held captive by a Taliban-linked group. Boyle gave a harrowing account of their plight to reporters Friday, saying captors had killed their infant daughter and raped Coleman. News of the rescue produced glowing praise of Pakistan from Trump and Tillerson. "This is a positive moment for our country's relationship with Pakistan," the president said in a statement. "The Pakistani government's cooperation is a sign that it is honoring America's wishes for it to do more to provide security in the region." That represented a softer tone toward Pakistan from Trump. In January 2012, he tweeted: "Get it straight: Pakistan is not our friend. We’ve given them billions and billions of dollars, and what did we get? Betrayal and disrespect—and much worse. #TimeToGetTough"
Husain Haqqani and journalists like Margaret Bourke-White cited by him who attack Jinnah are like little pygmies trying to denigrate a giant of history.